Hello and welcome to another fabulously fragrant week! Back in June APJ & I gave away five decants of Moonlight Patchouli by Van Cleef & Arpels, to help me gather some feedback on the fragrance and whether I was going nuts in smelling some of the more unusual notes that I found. Moonlight Patchouli starts out in-your-face boozy for a moment, then burns off to a gorgeous, sweet, very green patchouli. There is a warmth to it that might be the cacao. After half an hour, a buttery iris starts poking its head out. Unfortunately, another half hour later, the sweet, buttery side of the iris has left behind a more cardboard-y iris note that I don’t like very much. Maybe an hour later, the green-ness of the patchouli becomes more pronounced, and the sweet butter scent comes back. It mixes with a skin scent/warm leather (suede?) to make the absolute softest leather note. The soft, buttery leather/suede sticks quite close to the skin. I’m not quite sure when the smell faded away completely, but it lasted for far less time than a workday on multiple occasions. I don’t get salty/seaweed/chlorine at all, luckily! Dewy, perhaps, at times, particularly in the beginning. I like this scent a lot, and find it quite wearable, though not FB-worthy. The cardboard note in the middle is a bit off-putting, but mild enough to be tolerable. Moonlight Patchouli is reminiscent of something familiar from way back. It reminds me of a sweet wine at the beginning becoming richer and syrupy like but with the patchouli and suede/leather notes keeping the sweetness from running over and ruining everything. The Iris and patchouli are soft and beautifully blended together with a light suede note. The patchouli is not too strong and I love its presence with a bright fresh lemonade-like citrus, accompanied by white flowers and rose. I find it very comforting, not overpowering and it dries down to a wonderful sensual, rich base. I kept getting wafts where the perfume had gone on my hair and I thought – who is that – what is that beautiful smell – ohhh its me!!! 🙂 I find it to be long lasting – a good 7 hours. The ladies at work loved it and declared that I smelled really good! 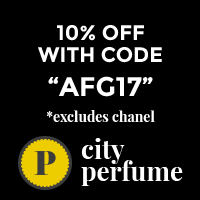 9/10 for me – Beautiful fragrance and definitely full bottle worthy! Thank you both so much for your lovely reviews! I’m glad you enjoyed the decants. What it has shown me is that the salt/chlorinated water note is just me, that it’s something to do with my skin or the way I interpret the smell. It is a consistent note, for a while I thought it might be the chlorinated water is stronger where I live, but I think not. I’ve been wearing Moonlight Patchouli this week and that middle note is consistent. Thanks again guys!! It’s been fun. Has anyone else had a chance to smell Moonlight Patchouli as yet? It is befuddling when you get something so out of the ordinary. When Val comes over this week we will give it a try if we come across it. Hey Tara, yea for sure, if you come across it let me know your thoughts.